Apt Video Converter is apt and powerful media converter which can convert almost all popular video and audio formats each other, such as converting AVI, MPG, WMV, RM, RMVB, ASF, MOV, MP4, 3GP, MKV, FLV, CD, VCD, DVD, MP3, WMA, AC3, OGG, AMR, AAC, WAV etc. In addition, you can convert your USB camera to these file formats, and can convert downloaded videos to your iPod, PSP, Zune, iPhone. This software have embedded and optimized many encoder and decoder, H264, Xvid, Divx, Mpeg4, Mpeg2, WMV3, RV40, Mjpeg, MP3, AC3, AAC, OGG Vorbis etc, so it have very fast conversion speed and excellent quality. Other features include friendly user interface, and freely changing convert setting such as bit rate, video size, audio parameter etc. 1 --- Real Media ( *.rm, *.rmvb ) . 2 --- Windows Meida ( *.wmv, *.asf ) . 3 --- Apple QuickTime Media ( *.mov ) . 4 --- Mpeg-4 Video ( *.mp4 ) . 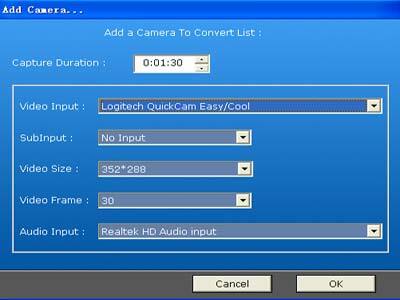 5 --- Flash Video Format ( *.flv ) . 6 --- VCD Video ( *.mpg, *.dat ) . 7 --- Super VCD Video ( *.mpg ) . 8 --- DVD Video ( *.vob, .vcd ) . 9 --- Audio Video Interleaved ( *.avi ) . 10 --- XviD Movie ( *.avi ) . 11 --- 3rd Generation Partnership Project ( *.3gp, *.3g2 ) . 12 --- Matroska ( *.mkv ) . 13 --- HDV 1080i Video ( *.m2t ) . 14 --- Windows Media Audio ( *.wma ) . 15 --- Dolby Digital AC-3 ( *.ac3 ) . 16 --- Advanced Audio Coding ( *.aac ) . 17 --- MPEG Layer-3 Audio ( *.mp3 ) . 18 --- MPEG Layer-2 Audio ( *.mp2 ) . 19 --- Ogg Vorbis Audio ( *.ogg ) . 20 --- Amr AWB Audio ( *.amr, *.awb ) . 21 --- Waveform Audio ( *.wav ) . 22 --- MPEG4 Audio ( *.m4a ) . 1 --- Windows Meida ( *.wmv, *.asf ) . 2 --- Apple QuickTime Media ( *.mov ) . 3 --- Mpeg-4 Video ( *.mp4 ) . 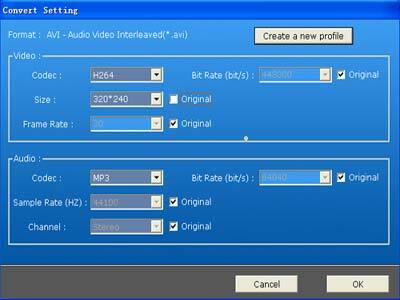 4 --- Flash Video Format ( *.flv ) . 5 --- SWF Video Format ( *.swf ) . 6 --- Audio Video Interleaved ( *.avi ) . 7 --- VCD Video ( *.mpg, *.dat ) . 8 --- Super VCD Video ( *.mpg ) . 9 --- DVD Video ( *.vob, *.vcd ) . 10 --- Game Psp Video ( *.psp ) . 11 --- XviD Movie ( *.avi ) . 12 --- 3rd Generation Partnership Project ( *.3gp, *.3g2 ) . 13 --- Windows Media Audio ( *.wma ) . 14 --- Dolby Digital AC-3 ( *.ac3 ) . 15 --- Advanced Audio Coding ( *.aac ) . 16 --- MPEG Layer-3 Audio ( *.mp3 ) . 17 --- MPEG Layer-2 Audio ( *.mp2 ) . 18 --- Ogg Vorbis Audio ( *.ogg ) . 19 --- Amr AWB Audio ( *.amr, *.awb ) . 20 --- Waveform Audio ( *.wav ) . FLV, MSMpeg4V3, RV40, RV30, RV20. MP3, MP2, AC3, AAC, WMAV2, PCM, COOK, OGG Vorbis. Copyright © 2006-2011 Timhillone Software Co.,Ltd.